The unsung hero behind this women is the most amazing man, father & husband I could have ever asked for. He is kind, smart, very good looking and the best Papa to our boys. He is the one that did hours of research to make sure Mason had the best treatments, care and doctors. He is the one that would spend a day making homemade food for Mason when he was in the hospital so that he would eat. He is the one that always had the best character voices when reading books and playing with Mase. He is the one that went to work so that I could stay home and take care of Mason. He is the one that held me in times when I could no longer deal, the one that wiped my tears off my face & the only one that understood how broken my heart feels. Iain (E-IN)(poor guy gets his name butchered all the time) without you I don’t know where I would be, how I would deal or how I would eat (lol). You make me so strong, push me to be brave & give me the strength to move forward. You are my rock, & I am so lucky to call you my husband. Even now your focus is on finding the best research & new treatments for kids battling cancer. 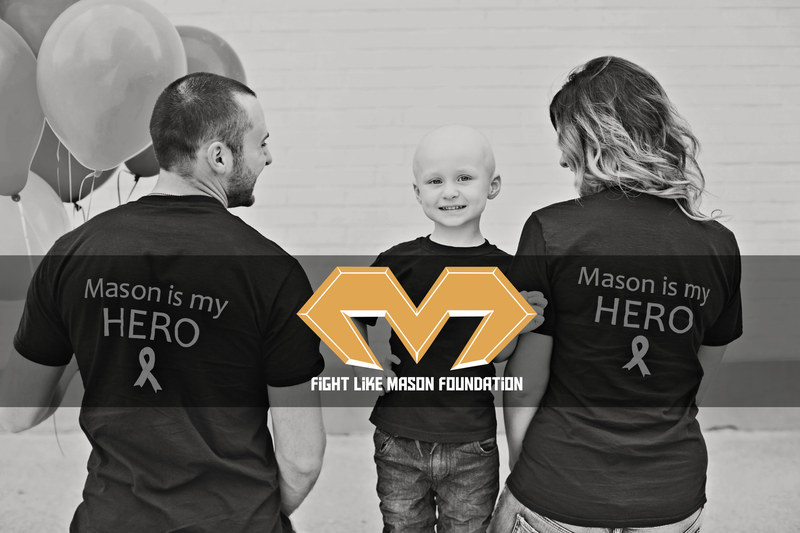 Without you by my side, the Fight Like Mason Foundation wouldn’t be where it is today. Last year on Father’s Day, I woke up next to Mason, hoping and begging the universe to keep him here for this day. I whispered in Mason’s ear, asking him to please keep fighting, because Papa needed him. As he responded to me, barely being able to speak, saying “I will Momma, because I’m brave”. This day ended up being so hard, so many emotions as we knew this would be the last Father’s Day that he would be here for. I watched my husband, hold him, kiss him, and tell him stories and I soaked every second of it in because I wouldn’t be sure if I would ever get to see him to a Papa again. It was a sunny day and Mason was up for going for a walk, of course in his wheelchair, so we did. The neighbourhood was quiet, the sun was setting & it was as if we were the only 3 in the world. I will cherish this day always. Father’s Day this year, is another bittersweet day, a day that Miller is able to love him, but Mason is missing. Iain, if I could have both our boys here for you today, I would do it in a heartbeat. We are so lucky to have you, I can never thank you enough for everything you do for each and everyone of us. Thank you for showing us so much love, you are truly the unsung hero in our family. Love you “bigger than this world” as Mason would say. Happy Father’s day to all the unsung heroes, the amazing dads. Happy Fathers Day Iain!!! I have to say you two are an amazing couple and the four of you are such a beautiful family!! !